Eeveelutions are adorable, but they can also pack a punch! Learn how to have fun and be competitive with these cute little guy. As a girl, I might be a little biased to playing a deck with Eeveelutions, but it has always been my goal to make an Eevee deck. In this article, I’m going to describe the different Team Plasma Eeveelutions and why some are played and the others are not. It is my belief that Eevees can be put in any deck. This Eevee’s Ability allows you to attach a basic energy from your hand. Then you may search your deck for the Eeveelution of the same type and evolve your Eevee. 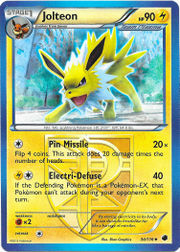 This card was what convinced me to build my first Eevee deck. The only way for Eevees to work is hitting hard and hitting fast. This Ability allowed Leafeon to evolve first turn and quickly use Energy Crush. This Eevee however doesn’t help Flareon. You’re attaching Double Colourless Energies (DCEs) most of the time which doesn’t allow you to use the Ability. Most Flareon decks don’t even run Fire energies. 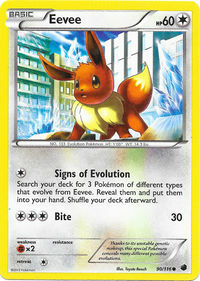 That’s why you may see the other Signs of Evolution Eevee in those decks. At 60 HP, this Eevee has 10 more HP than its Energy Evolution counterpart. 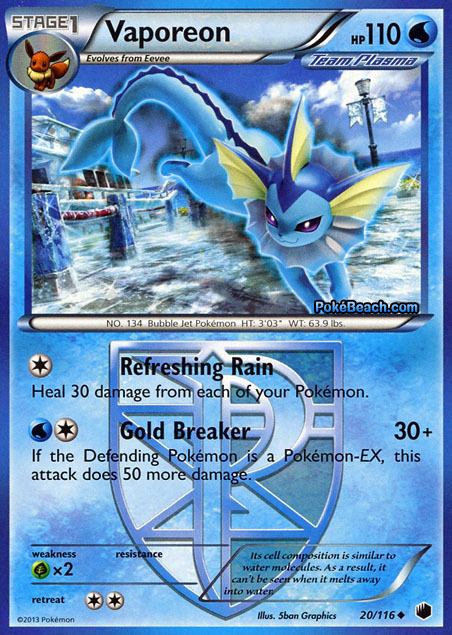 Not only is it a little more resilient, but its first attack can be used to seek out Eeveelutions from your deck. 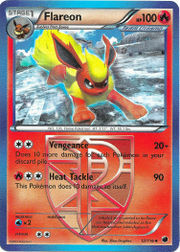 This is what you’ll see in Flareon decks, so they can quickly obtain a Flareon to evolve their next turn. It still is unfortunate to waste a turn like that, but sometimes it may be your only option. This Eevee can also be useful in a straight Eevee deck, especially if you aren’t exactly sure what your opponent is running yet. Let’s say your opponent starts with a Jirachi and nothing else. 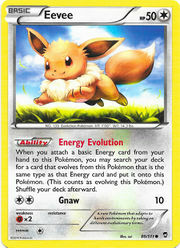 That Pokemon can be played in any deck, so you may not know what Eevee to evolve to. 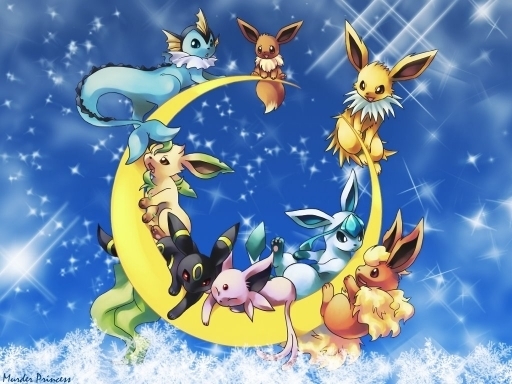 With Signs of Evolution, you can pick three different Eeveelutions from your deck to keep in hand until you decide which will be the best to beat your opponent’s deck. I’m going to talk about them in the order they appear in the Plasma Freeze set, so let’s talk about Leafeon. With a base of 100 HP, this Stage 1 may seem a little low on HP to be playable. Training Center helps an Eevee deck out tremendously with an extra 30 HP going a long way. 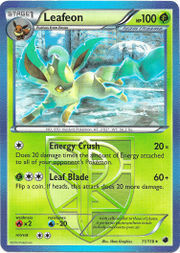 The main reason Leafeon has been so playable is its first attack, Energy Crush. Its cost is one colorless energy, allowing it to fit into any deck. What makes Leafeon unique from other Pokemon like Mewtwo or Yveltal is the fact that energy on all your opponents’ Pokemon power up this attack. This way, you don’t need to Lysandre the Pokemon with all the energy to do all the damage. Another upside to Leafeon is its resistance to water. Minus 20 may not seem significance, but when you’re facing Seismitoad that little extra cushion really helps. If you are playing an Eevee-centered deck, Leafeon is still a great addition. Even though his first attack Vengeance only requires two Colorless Energy, this in no way means he can fit in any deck. If you plan to play Flareon, the entire deck must be built around it. This attack does more damage for all your Pokemon in the discard, so don’t be afraid to Professor Juniper that hand away! Now 10 more damage per Pokemon may not seem like much, but most Flareon decks are running over 20 Pokemon, allowing for an easy OHKO (One Hit Knock Out) on powerful EXs. With a base HP of 110, Vaporeon has the highest HP of all the Eeveelutions, but that doesn’t mean it’s the most powerful. The first attack Refreshing Rain heals damage from all your Pokemon for one Colorless Energy. The second attack packs a little more punch, doing 80 against EXs. It may not seem like a lot when most EXs are around 180 HP, but with some Deoxys on the bench and a Silver Bangle, it can easily OHKO Fighting EXs. That’s the only time I ever found Vaporeon even remotely useful. The Energy cost is also one Water and one Colorless, so without Colress Machine it takes two turns to power up. Eevees are too low on HP to allow them to sit for two turns without attacking. They rely on quick OHKOs. This Eeveelution only has 90 HP and takes one Water and two Colorless to hit for 60. Not only does it look majestic, its Ability gives all Team Plasma Pokemon two less retreat cost. This allows you to easily switch between Eevees or even promote a Deoxys to stall a turn. Now let’s talk about the attack. Three energies may seem daunting, but paired with Colress Machine and Thundurus EX, you can attack for up to 130 with Deoxys and Bangle, which sadly still isn’t enough to OHKO strong EXs. 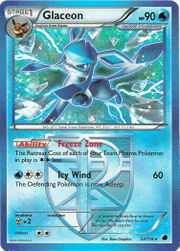 This usually means leaving Glaceon to die in the active, unless you are lucky enough to keep the opponent Asleep. With a base HP of 90 and a weakness to Fighting, Jolteon never seemed very viable to me. It takes two turns to use its second attack, which only does 40 damage. The only reason I could see it played would be to combat Dark, but even 80 damage isn’t anywhere close to reaching the OHKO. And even though the attack doesn’t allow the Defending Pokemon to attack next turn, most Dark decks are running Darkrai which gives them free retreat anyway. Jolteon is easily knocked out and doesn’t pack enough punch to prove worthy of a spot in an Eevee deck, even a Plasma-based one. Pin Missile has helped win games by giving a quick Jirachi knockout early on, but I still wouldn’t recommend it if you’re going for a top tier deck. But if you’re looking to have some fun, pair it with the Victory Star Victini and just try for the Pin Missile. 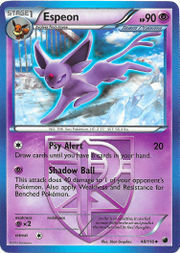 Espeon is one of my favorites of the Eevees which made me very disappointed in this card. It’s on the lower end with 90 HP, with only one retreat cost, but I hardly ever pay attention to their retreat cost since I’m always assuming if I promote it, it’s being knocked out before I’ll have the chance to retreat. Espeon’s attacks only require one energy a piece, helping it out. The thing I love about Psy Alert is its one of those attacks that you use to draw cards, and it also does 20 damage. Its real attack, Shadow Ball, does 40 damage to any of your opponent’s Pokemon. Unfortunately, I don’t think this Espeon is worth playing in a competitive deck. If you just want to have fun, build a deck and play away. There just aren’t enough Meta decks right now that would take a heavy hit from Espeon to make it worth playing. I wanted to put Umbreon in an Eevee list, but it just wasn’t possible. You only have four Eevees to evolve, so unless you’re planning on playing Revive to bring them back, there’s not a lot of room for Eevees that only sit the bench. Umbreon has 100 HP and its Ability gives all your Team Plasma Pokemon 20 more HP. This Ability is stackable, much like Deoxys, so with four on the bench, you could be adding 80 more HP to your Pokemon. 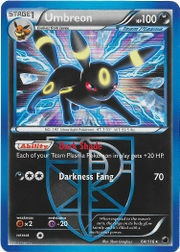 Sadly, this still doesn’t fit well in an Eevee deck and I wouldn’t consider Umbreon’s attack very viable. For a Dark and two Colorless you’re only hitting for 70 – It’s definitely not meant to be an attacker. Whether you’re building a deck for competition or just to have a good time, Eevees can be used to great and fun effect. I would love to hear about other Eevee decks that have been put together. Eevees will always be dear to my heart and I will play them until I win or die trying. Growing up, we moved around a lot, as my dad was a miner. We moved where there was work. It was just the four of us: mom, dad, little brother and me. When I was 15 we finally stopped moving. We have now lived in Alberta for 15+ years now. I met my husband while working at Park Plaza Theater. We have been married for eight years now and now reside in Central Alberta.